After several line-up changes and self-made demos, Mercyful Fate released their self-titled EP in 1982, with the line-up of King Diamond (vocals), Hank Shermann (lead and rhythm guitars), Michael Denner (rhythm and lead guitars), Timi Hansen (bass) and Kim Ruzz (drums). With this line-up the group recorded their first two studio albums (1983's Melissa and 1984's Don't Break the Oath), until 1985 when the band broke up due to musical differences. In 1993, four out of the five members of Mercyful Fate reunited to record the album In the Shadows, which was released the same year. During the 1990s, the band released four more studio albums and went through several line-up changes. Since 1999, Mercyful Fate have been on hiatus, but have reunited on occasion during the 2000s. Mercyful Fate was originally formed in Copenhagen, Denmark, in 1981, following the dissolution of the band Brats. Brats had been a punk/metal band, featuring future Mercyful Fate members, vocalist King Diamond, and guitarists Hank Shermann and Michael Denner. After two studio albums and several line-up changes (including the addition of Diamond and the departure of Denner), Diamond and Shermann began writing new material that was much heavier than any of Brats' previous work. The band's record label CBS was not pleased with the material, and demanded they stop singing in English and become more commercial. As a result, Diamond and Shermann quit the group and went on to form Mercyful Fate. Former Rock Nalle bassist Ole Beich (later of L.A. Guns and Guns N' Roses) briefly joined the band around this time. After several line-up changes and semi-professional demo tapes, Mercyful Fate released their self-titled EP in 1982. This line-up, consisting of King Diamond, Hank Shermann, bassist Timi Hansen, drummer Kim Ruzz and guitarist Michael Denner, would go on to record the group's first two studio albums. In July, 1983, Mercyful Fate recorded their debut album at Easy Sound Recording, in Copenhagen, Denmark. Entitled Melissa, the album was produced by Henrik Lund and released on October 30, 1983 on Roadrunner Records. After a number of concerts around Denmark, Mercyful Fate entered the studio in May 1984 to record their second studio album Don't Break the Oath, which was released on September 7, 1984. During the album's supporting tour, the band played the US for two months and made festival appearances in Germany. Despite winning a cult following around the world, Mercyful Fate broke up in April, 1985, due to musical differences. Guitarist Hank Shermann wanted the band to move to a more commercial sound; King Diamond refused and announced his departure from Mercyful Fate, which led to the band breaking-up. Mercyful Fate were a part of the first wave of black metal, along with other groups, such as Venom, Bathory and Hellhammer. Many of these groups helped establish the style upon which future black metal artists would later build. Unlike the other first-wave bands, typical elements of Mercyful Fate's style are influences from progressive rock, epic 1970s hard rock and traditional heavy metal. 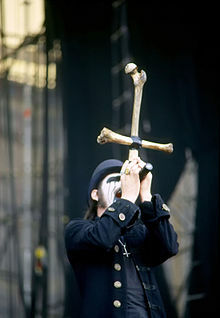 As many of the band's songs featured lyrics about Satanism and the occult and King Diamond was among the first black metal musicians to use the now famous corpse paint, Mercyful Fate was a pioneer in developing black metal, although their musical style was not as much an influence as that of other first wave bands. ^ a b c d "Mercyful Fate: Melissa - Review". AllMusic. Retrieved 2012-12-09. ^ Sharpe-Young, Garry & Born, R. "Mercyful Fate". MusicMight. Archived from the original on 2012-09-20. Retrieved 2009-12-08. ^ "Melissa - Mercyful Fate - Songs, Reviews, Credits - AllMusic". AllMusic. ^ a b c d e "King Diamond interviewed in 1997". YouTube. Retrieved 2012-12-09. ^ a b c d e "Mercyful Fate". AllMusic. Retrieved 2012-12-08. ^ a b Götz Kühnemund: A History of Horror. In: Rock Hard, no. 282, November 2010, p. 20-27. ^ a b c d e Björn Thorsten Jaschinski: Seziertisch. In: Rock Hard, no. 282, November 2010, p. 28. ^ a b c "Mercyful Fate: Don't Break the Oath - Review". AllMusic. Retrieved 2012-12-09. ^ a b c d Dunn, Sam (2005). Metal: A Headbanger's Journey (motion picture). Seville Pictures. ^ "Esbjergs største rockstjerne havde en destruktiv djævel". 2 January 2016. ^ a b c d e f g h i j k l m n o p q r s t "Mercyful Fate - Band members". KingDiamondCoven.com. Retrieved 2012-12-08. ^ "Mercyful Fate at KingDiamondCoven.com". KingDiamondCoven.com. Retrieved 2012-12-10. ^ a b "Melissa at KingDiamondCoven.com". KingDiamondCoven.com. Retrieved 2012-12-08. ^ "Don't Break the Oath at KingDiamondCoven.com". KingDiamondCoven.com. Retrieved 2012-12-08. ^ a b c d "King Diamond - Interview". YouTube. Retrieved 2012-12-08. ^ a b "King Diamond interviewed on the Music Box". YouTube. Retrieved 2012-12-08. ^ a b c d "King Diamond - Band members". KingDiamondCoven.com. Retrieved 2012-12-08. ^ "King Diamond - Interview 1987". YouTube. Retrieved 2012-12-09. ^ a b c "Fate". AllMusic. Retrieved 2012-12-09. ^ "The Beginning at KingDiamondCoven.com". KingDiamondCoven.com. Retrieved 2012-12-09. ^ a b "Return of the Vampire at KingDiamondCoven.com". KingDiamondCoven.com. Retrieved 2012-12-09. ^ "A Dangerous Meeting at KingDiamondCoven.com". KingDiamondCoven.com. Retrieved 2012-12-09. ^ a b "In the Shadows at KingDiamondCoven.com". KingDiamondCoven.com. Retrieved 2012-12-08. ^ "Sharlee D'Angelo Interview". About.com. Retrieved 2013-01-07. ^ "The Bell Witch at KingDiamondCoven.com". KingDiamondCoven.com. Retrieved 2012-12-08. ^ "Time at KingDiamondCoven.com". KingDiamondCoven.com. Retrieved 2012-12-08. ^ "Into the Unknown at KingDiamondCoven.com". KingDiamondCoven.com. Retrieved 2012-12-08. ^ a b "Dead Again at KingDiamondCoven.com". KingDiamondCoven.com. Retrieved 2012-12-08. ^ "9 at KingDiamondCoven.com". KingDiamondCoven.com. Retrieved 2012-12-08. ^ "Force of Evil". AllMusic. Retrieved 2012-12-09. ^ "BLABBERMOUTH.NET - KING DIAMOND: MERCYFUL FATE 'Is Definitely Not Finished, At Least In My Book'". Roadrunnerrecords.com. Archived from the original on 2008-04-22. Retrieved 2011-07-06. ^ a b c d "King Diamong Comments On 'Guitar Hero: Metallica' Game Inclusion". Blabbermouth.net. 2009-02-26. Archived from the original on 2009-03-01. Retrieved 2012-12-08. ^ a b "Metallica Joined by Mercyful Fate, Anthrax, Armored Saint Members for Second 30th Anniversary Show". GuitarWorld.com. 2011-12-08. Retrieved 2012-12-08. ^ "On the Role of Clothing Styles In The Development of Metal – Part I". Metalstorm.ee. 2005-07-05. Retrieved 2012-12-08. ^ "Kerry King interviewed by Metal Hammer". YouTube. Retrieved 2012-12-08. ^ "Metallica performing "Mercyful Fate" w/King Diamond and Hank Shermann in 1999". YouTube. Retrieved 2012-12-09. ^ "Metallica performing "Mercyful Fate" w/ King Diamond on August 9, 2008 in Dallas, Texas". Metallica.com. Archived from the original on January 1, 2013. Retrieved 2012-12-09.